I am using the Wireless (WLAN) mainly to connect my mobile phone to the internet, for faster downloads and to test mobile apps. First, I only used Apple devices (such as iPad, iPod, iPhone, etc. ), and those could connect without problems to a so-called Ad-Hoc network. However, many mobile devices, such as Android, unfortunately will NOT connect to an Ad-Hoc network, for reasons which are very well explained on this How-To Geek posting (it taught me about many things I didn’t know! ).Since I’ve recently given up on Apple products and only use Android phones, I needed a definite answer to this problem. And I found it today. As you may know, there are basically 2 modes to operate a wireless network: “Ad-Hoc” and “Infrastructure” (the latter one also called “Access Point” or shorter “AP”) mode. 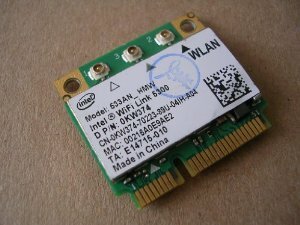 Cheaper Wireless cards only support the Ad-Hoc mode, but do NOT support the AP mode. It is supported beginning with Kernel version 3.2. I mounted it, and was planning to use the Network Manager of Debian Wheezy / Gnome 3 to quickly set up an AP Hotspot. Easier said than done! Because even though there is an option to set “Infrastructure” mode, my Android phone still would not connect. It would simply write “Ad-Hoc Connecting” and stop there, even though I had set the Infrastructure mode. 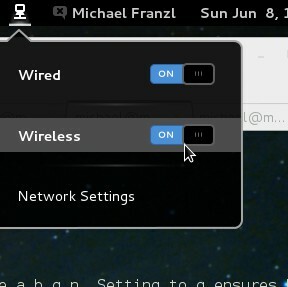 Network Manager in Debian Wheezy / Gnome3 offering “Infrastructure” mode which is not recognized by an Android smartphone, even though the network card supports AP and is fully supported by the Kernel. I had to wade through a LOT of web postings, all suggesting not-really-working ‘solutions’ until I found a synthesis of all the collected information that worked for me. It turns out that you need a dedicated user-space program for ‘driving’ the AP hardware contained in your network chip, and this is hostapd . It seems, you can’t do without. The author of this blog wrote a second post to avoid the locally run DHCP server in favor of re-using the DHCP server of the network (e.g. the modem) by using dnsmasq , which is yet another locally run server, only a bit simpler, but has to be configured also. I tried it to no avail. Same problem: phone would disconnect immediately. Frustrated, I moved on. Then I found ths blog which brought a new idea: the concept of bridging between network interfaces instead of using iptables, which, and this is the good news, is supported ‘natively’ by hostapd and the Linux networking system configured by /etc/network/interfaces . However, this solution still did not work for me. After modifying /etc/network/interfaces accordingly, I managed to mess my internet connection up. It turned out that setting up a bridge between Ethernet and Wireless is not that trivial! Even the highly official Debian Wiki BridgeNetworkConnections would not give working results for my case. So, I started crossreferencing between other solutions and finally came up with the following sequence of commands that work for me on my pretty standard Debian Wheezy laptop with one ethernet adapter (eth0) and the above mentioned Intel network adapter (wlan1). You only need to install 2 packages (bridge-utils and hostapd). With my method, there is no need for a locally installed DHCP or DNS server, and no need to modify the /etc/network/interfaces file. There is no requirement to permanently make changes to your network configuration. In an emergency (if you are stuck somehow), a reboot will reset your network configuration to the defaults. Devices connected to your newly created wireless network will be served by the DHCP and DNS server specified in your router/modem. Your mobile phone will be a regular and equal member of your LAN. … install bridge-utils. These are helper programs. Next, remove the attached IP address from the Ethernet card eth0. Bridging will not work when an IP address is set. Next, turn on IPv4 networking for your wireless card. This is necessary, otherwhise one of the next steps will give the error “can’t add wlan1 to bridge br0: Operation not supported”. Only after that, you can turn of Wireless in your Network Manager. Again, if you are stuck, just reboot. I hope this helps somebody, it worked for me, if not, write me a comment. Thanks for the detail information. 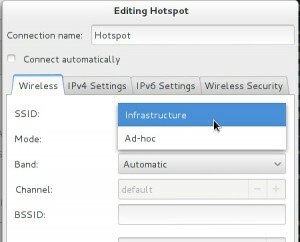 I just share my Ubuntu Wifi setting as an “Access Point” (Not Ad hoc) for Android Wifi connection. (1) Go to Ubuntu Software Center and install “kde-nm-connection-editor”. (2) Open it and click “Add”. Select “Wireless (Shared)”. (3) In the Wireless tab, change Connection Name, SSID name, and select “Access Point” in Select Mode. (4) Setup the connection password in Wireless Security tab. (5) Double check IPv4 tab, Method: “Shared to other Computers” (6) Close the program. 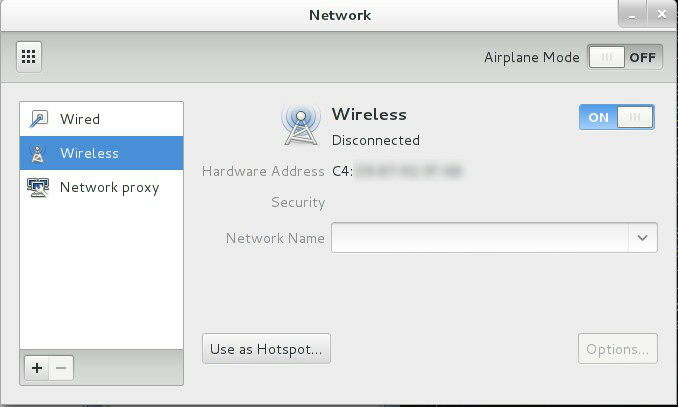 Turn on the Wifi Access Point by click the wireless connection, select “Connect to hidden Wifi Network”, choose the SSID that was just created. (7) Turn on Android Wifi and connect. 4addr mode has nothing to do with “IPv4 networking”. 4addr mode enables transmission of 4 MAC addresses in each data packet to enable clients on one side of the bridged network to reach clients on the other site. Not everything is subjective; there is only a finite set of viable interpretations [of reality]. There are some ways that lead to perdition, very, very quickly.